May 4, 2016 By Elise 2 Comments This post may contain affiliate links. Please read my disclosure policy for more info. My husband is allergic to chicken eggs, and has a cute little flock of adoring ducks (and I do mean adoring! Of course, they love anyone who feeds them. ;)) to make up for it. Well, they will when they start laying eggs – for now, we keep a local duck owner in business. But still, I insist on keeping a few chickens around for myself and the kids for the simple reason that I don’t care for the taste of duck egg yolks. Regardless of whether we’re talking about ducks or chickens, they’re one of the best pets you can have in your backyard! What other animal is friendly, pretty, fun to watch, and feeds your family all at the same time? 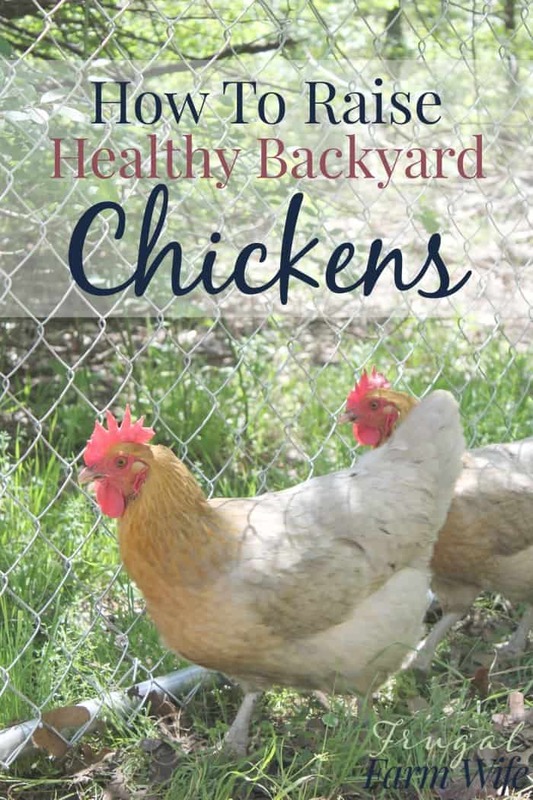 With that said, keeping your backyard chickens healthy is important, and only takes a little bit of forethought. Give them a water-tight house. It doesn’t have to be fancy or any taller than a small dog house, but your chickens need to be able to roost off of the ground in order to satisfy their instinct as prey animals, and keep them dry during wet weather. Do make sure that you situate their house on the highest part of your yard as possible to allow for the best drainage, and always make sure that the roof is leak-proof. Keep their house clean. Your chickens will produce droppings throughout the night that you will need to scoop out every few days or weeks. Small chicken pens can be propped up to allow for easy cleaning, and you can re-bed the pen floor with straw or hay to soak up future droppings. Alternatively, you can move their pen to a fresh patch of grass each morning, and let the sun and rain take care of the last day’s droppings naturally, while keeping your chickens clean! Fresh Chicken Litter is known as a “hot manure” meaning that too much of it is indeed too much of a good thing. Even so, it can make a fantastic fertilizer when spread sparingly on gardens or yards. Perhaps the best alternative though is to compost your litter in order to mitigate the danger of burning garden plants. Give them grass. Your chickens need to be let our of their pen every day – or at least to have their bottomless pen moved daily to give them access to fresh grass and bugs. 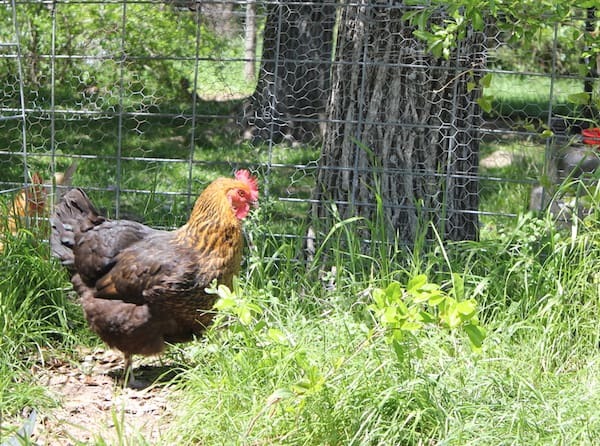 The chlorophyll and other nutrients in the grass and weeds help keep your chickens’ immunes systems strong, and gives their egg yolks that nice, rich orange color that farm fresh eggs are so well known for. This can be challenging in the winter time, but in the south, we can often cut wild grasses to feed them, or plant winter grasses for them to self-harvest. In the north, it’s a good idea to look into feeding you chickens alfalfa pellets to keep their chlorophyll levels high. Give them Good nesting areas. This doesn’t apply at all for ducks, who in my experience lay eggs wherever they happen to be, but for chickens, a nice laying box with some comfy straw to scratch around in is important! You’ll want to be sure to gather your eggs every day, and change the nesting straw frequently to keep things clean. Give them quality feed rations. I know it probably goes without saying, but “you are what you eat” is just as true for chickens as it is for us. The best way to keep your chickens – and their eggs – healthy is to make sure they have access to a quality chicken feed, formulated to have the right nutrients for their needs. Gabriel and I have been delighted to feed our chickens Purina® Organic Layer Poultry Feed over the last month. You all know that I’m not always a die-hard organic buyer, but for our animals, I make an exception, because when it comes to animal feed, I have found that purchasing organic is the absolute most reliable way to ensure that I’m avoiding genetically modified ingredients. Why is that important? Well, for instance soy is an important ingredient in chicken feed because it provides your birds with lysine – a critical nutrient. did you just recoil a little bit? I know, most people do! But did you know that organic soy is not the monstrosity that you’ve heard about? Nope. Soy is important to your chickens’ health, and when it’s organic like it was meant to be, you don’t have to worry about any of the negative impacts you’ve heard about. 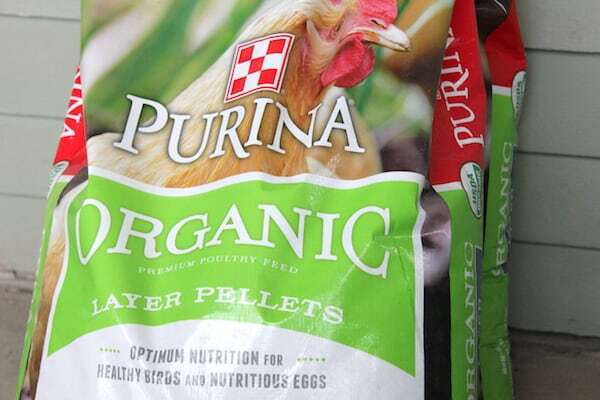 Our chickens love Purina’s organic layer pellets, and they’ve never been healthier! 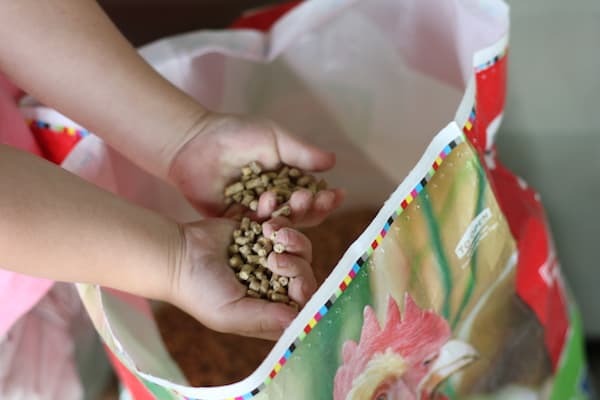 Are your interested in Purina® Organic Poultry Feed? Go to this store locator and enter your zip code to find your nearest retailer. Then Click here to print a $5 off coupon! Okay… how would you like to win a bag of organic poultry feed for your flock? Just fill out the rafflecopter entries below for your chance! Purina can’t be beat. I’ve fed it to my horses, and now chicken, for years.